How Intimidator UTV's Are Helping Farmers All Over America | Intimidator Inc.
UTV's have been closely associated with farmers and landowners for quite some time, and are useful tools that can also be utilized for fun and recreation. Intimidator not only makes a quality UTV that is good looking and long lasting, but they are also power houses. 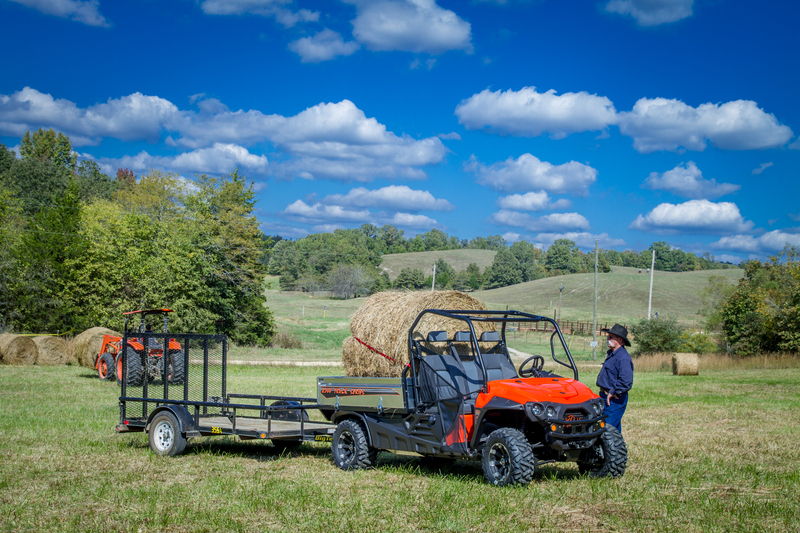 Farmer's UTVs are an important piece of machinery, and being reliable is critical. We take pride in Intimidator's reliability. Our American made UTV's, are manufactured at our headquarters in Batesville, Arkansas. We have tried and tested the top farm UTV's on the market and made improvements. We use oversize components, top quality American steel, and upped the torque to give up to a whopping 1200lbs cargo bed capacity and 2100lbs towing capacity on our Classic Series Diesel UTV. This fact alone means that moving a pallet of soil or feed one wheelbarrow at a time is a thing of the past. Our Truck Series has the same features as our Classic Series model, but gives you the convenience of a UTV with a truck bed. The Truck Series bed is made with aluminum and has fold-down sides and tailgate to easily convert to a flatbed. Intimidator also has a Crew series that seats six to get your friends, family, or employees from one part of your property to another without wasting valuable time. Aside from just hauling loads from place to place, you can take your UTV to places most vehicles can't go. They maneuver into and out of difficult places with ease, and can be fitted with accessories for a multitude of purposes. Intimidator has a wide variety of accessories to turn your plain UTV into a farming UTV. For example, a GroundHog Max UTV Plow can be attached in minutes for plowing food plots, a Warn Pro Vantage 4500lb Winch can easily pull that fallen tree blocking your path or uproot that bothersome stump, or attach one of Bad Dawg Accessories' Intimidator Snow Plow can be easily attached to clear away the snow. If you're in the market for a side by side with diesel, take your pick from any of our three current available series...Classic, Crew or Truck Series. We are proud to offer a quality, yet affordable UTV, and have some of the best financing options available. To find a dealer near you, use our convenient dealer locator. In all seriousness, farmers are such a vital part of our everyday lives, and are often taken for granted. Their continuous hard work puts food on our tables, and we at Intimidator hope our hard work at developing a machine that is not only fun, but hard working makes their lives just a bit easier. Want more information? Download our Free Product Catalog!